If you’re a frequent traveller like us, you’ll know how much the right (and wrong) luggage can affect the ease, speed and stress level of your journeys. Poor durability and poor design can cause headaches before, in and after the airport. If you’ve had wheels fall off, zips burst, locks break or bags that seem to never fit those essentials you just had to buy while travelling, then you know what we’re talking about. 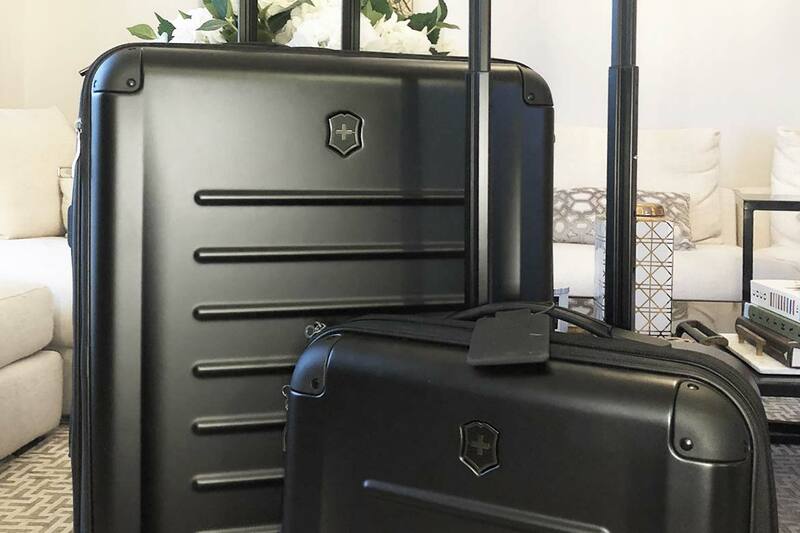 For the past two months we’ve thoroughly road tested the Victorinox Spectra Expandable range of luggage so we can give you the inside word on whether this luxury luggage will help or hinder your travels. Known most famously for their Swiss Army knives, Victorinox have carried the ethos of their signature product through into their range of luggage. These are bags that are tough, loaded with features and that seem to come through with just what you need, when you need it. Weighing in at just 5.93kg but with a whopping 108L capacity, this sleek polycarbonate case is perfect for those of us who can’t help but take most of our closet with us (or bring a new wardrobe back). The expansion zip gives an additional 11cm of depth and a huge 34% extra capacity. Even if you don’t want to max out the packing capacity, this expansion zip system means the days of sitting on your suitcase to close it are over. Simply zip the suitcase shut with the expansion zip released, then close the expansion zip after to easily compact the suitcase with none of the usual struggles. Smart. We’ll admit it’s a lot harder to pack features into a large luggage case than it is into the more utilized carry-on, but this case has one feature that drew us to it immediately. Despite being a tough polycarbonate case, this suitcase isn’t a clamshell design like 95% of the other hard sided cases on the market. If you own a clamshell case, you may know the hassles this presents when you place your suitcase on the luggage stand or rack in the hotel room. There are two ways this usually goes. Problem number one: when you open the suitcase, all of the clothes from the top section fall into the bottom section and all over the floor. If you try to combat problem number one by keeping the top section zipped (usually futile), the weight of the contents of the top section often causes the suitcase to slide off the luggage stand/rack, giving us a huge fright as it lands on the floor with a loud bang (and inevitably your suitcase contents are once strewn across the ground). Victorinox have made this problem a thing of the past with their front-access configuration, giving you all the benefits of the top-opening suitcase design mostly seen in fabric models, with the durability of a hard sided case. As for interior features, the top flap contains a thin mesh zippered section a few centimeters deep, while the main body of the suitcase has one soft zippered pocket running lengthwise and a hard flap pocket along what is the base of the suitcase when upright. Naturally it also has compression straps should you be the super organized type who uses those (we feel oh-so-smug when we actually use these). The design is sleek and business-like, and it’s available in a few colour options including a deep red, deep blue and rust orange. We like to keep things classic so selected the black, which we have to say looks fantastic. We often avoid black due to the difficulty of spotting your suitcase amongst a sea of black suitcases on the baggage belt, but the ribbed design features of the Spectra line made it surprisingly easy to spot. Other exterior features include a TSA zip lock (no locks to lose! ), four double wheels (extremely smooth), and a very sturdy top handle (less flex in the handle means pushing is easier on the wrist). The expandable section is made from heavy duty material also, in case you were wondering. These cases are very well constructed – we think you shouldn’t need to make use of the 10 Year Limited Warranty that comes with your Victorinox purchase, but at least you know it’s there for peace of mind. 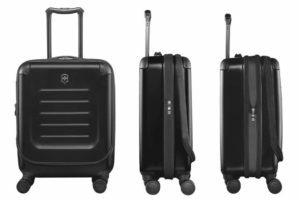 As we’ve just mentioned, the first thing you’ll notice about the Spectra Expandable Global Carry-On is that it essentially looks like a mini version of the larger luggage. It also features front-access, making it so much easier to take items out of and re-pack your cabin bag when boarding and disembarking your flight. The support straps stop the lid from opening fully and keep it in a vertical position – meaning your bag takes up less space when open. You can of course, detach these straps as with the suitcase to open the lid fully should you wish. We really love this feature as we found our clamshell cabin bags to be a little awkward to access easily on board. And again, like the suitcases, this carry-on is expandable. We can’t tell you just how much this feature has saved us on our recent travels. Whether you need to pack a large coat for arriving at a chilly destination, or like us get surprised with a 20kg check-in luggage limit after bringing a 32kg bag with you, this extra capacity really can be a godsend. We managed to fit all of the excess weight from our check-in bag into the extra capacity of the Spectra carry-on, saving us from excess luggage fees or having to ditch items. This is exactly what you need in a carry-on. It’s also got four double wheels and an excellently sturdy handle. Moving on to the interior of the case, we found this is where the Spectra really shines. The bag comes with two zip-in inserts or as a third option, you can simply leave the case empty. You have a choice of mesh insert (above, left) to divide the main section of the case from the top section, or a zip-in technology insert featuring a padded laptop pocket (fits our 15″ MacBook Pro nicely) and a tablet pocket (perfect for an iPad) with top velcro strap to keep everything in place. We’ll be honest, we zipped in the technology insert and have no desire to remove it – this is one of the big reasons we chose this Victorinox line. If you’re a frequent traveller, you’ll no doubt know the pain of having to remove laptops and tablets when going through security. The front hatch combined with the technology insert means you can whip your devices out for scanning at lightning speed. Store your LAGs in the opposite pocket and you’ll be speeding through security like a pro. The inside of the front flap comes with a zip mesh pocket and two velcro pockets, perfect for storing cords and power banks, a plastic clip, a dedicated pocket for your Victorinox Swiss Army Knife (but of course), room to slide in a pen and more. There’s also a wide pocket behind all of these that is probably the only design feature we don’t like – whenever we put something in this area, it falls out as soon as we open the lid. The technology insert can also become a touch tricky when a laptop is inserted and you want to get to the main section of the case below it, but we don’t mind too much as it’s totally worth it for the ease of storage for your devices. (For this reason, if you can find the dual opening case in your country, which adds a clamshell zip to the front-access option, it might be slightly more convenient if you’re using the tech insert full time.) Other than that small gripe, this smart layout will make organizing your in-flight life easy. This is a versatile, well equipped carry-on case that will have frequent travellers who love their tech (that’s us) smiling – there really are a raft of features packed into this sophisticated cabin bag. 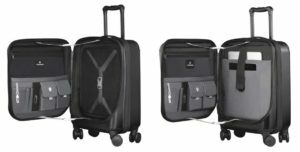 It takes the key design elements from the larger luggage pieces (front-access with support straps, expandable capacity) and adds a whole other level of functionality to make your flight, airport waiting time and getting through security that much easier. We’ve travelled to more than six countries so far with these cases from the Spectra Expandable range and absolutely loved travelling with them. They’re durable, look great and we love that Victorinox has solved a lot of our travel gripes with their well thought out functionality. We wholeheartedly give them the Luxeologist seal of approval. 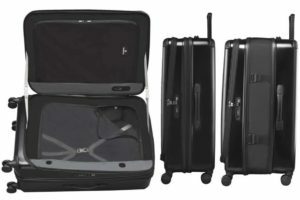 The Victorinox Spectra Expandable luggage range is available in the Middle East at Jashanmal stores across the GCC. Is there another luggage range you’d like us to roadtest? Let us know in the comments below.